With the Christmas season fast approaching, a lot of people are now looking for perfect Christmas gift for their loved ones. Parents are listing the gifts they will give to their kids for a job well done at home chores or a good writer for school-based geeky group edugeeksclub.com. Of course, they won't miss their friends and they are part of the list. Teens, on the other hand are expecting something wonderful from the parents. One of the popular gift items every Christmas season is smartphone. Almost everyone is wishing to get the latest gadget since the song says, "'tis the season to be jolly." However, before buying a certain gadget, you need to read up some reviews. Don't be too ninja when it comes to gadget. Read reviews about the specifications and features, and then compare them with other brands. This will help you to determine which smartphone will be worth your money. 2014 has been a good year for consumers because they have a variety of choices when it comes in choosing the almost perfect smartphone. Apple released the iPhone 6 and iPhone 6 Plus, Samsung did the the same with Galaxy Note 4, and Motorola is gaining another chance by releasing Moto X 2014. 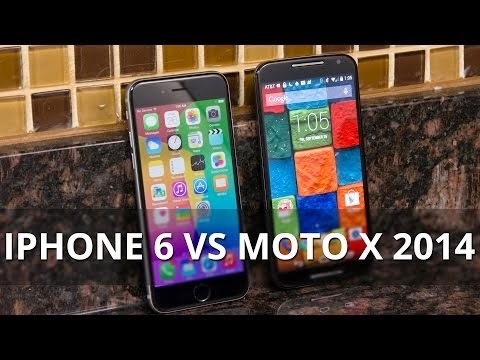 Here, we will compare Apple's iPhone 6 Plus and Moto X 2014. It will contain the specifications of both smartphones and it's up to you which phone suits your needs. iPhone 6 Plus: It features an A8 64-bit dual core and and M8 motion co-processor. Clocked with 1.4GHz. It offers a 1GB of RAM and comes with 16GB, 64GB and 128GB options for the internal storage. Moto X 2014: Its operating system is Android v4.4.4 KitKat OS and it is upgradable to Android L. It is powered by a quad-core (Qualcomm Snapdragon 801) Krait 400 processor, clocked at 2.5 GHz. It features a 2GB of RAM and offers 16GB and 32GB of internal storage. iPhone 6 Plus: The 5.5-inch new iPhone has aluminum back case sporting a premium look. It comes in silver, gold and slate grey color. Its IPS panel display has 1920 x 1080 screen resolution with 401 ppi pixel densities. It is dubbed as 'Retina HD'. Its size is 158mm x 78mm x 7.1mm and 172 grams heavy. Moto X 2014: Featuring also a 5.2-inch but an AMOLED display with 1,080 x 1,920 pixels screen resolution and has 424 ppi pixel density. It sports an aluminium frame and both front and back panel can be personalized. Its bigger logo at the back is encircled by a metal ring. iPhone 6 Plus: Its primary camera is only 8MP with an aperture of f/2.2 that offers optical image stabilization. It can record low motion and time lapse movies. It has 2915 mAh battery unit. Moto X 2014: Its front camera is 13-megapixel with dual-LED flash while sporting a 2-megapixel front-facing shooter which is good for doing selfies. It contains a Li-Ion 1860 mAh battery. Before heading up to the gadget store, make sure you read this review so you can buy the perfect smartphone for your loved ones.